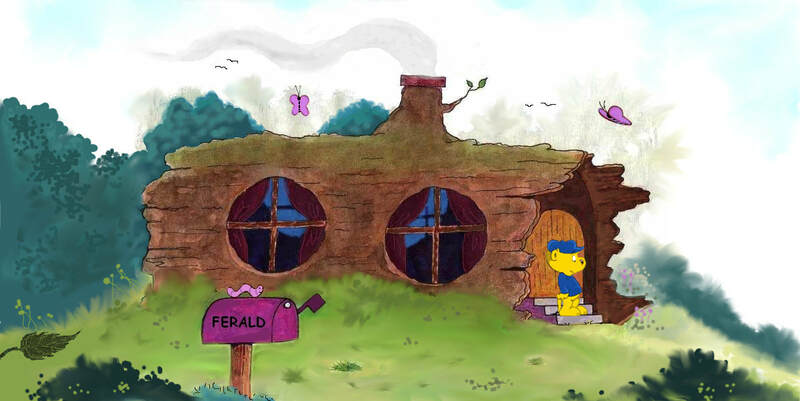 In a simple place known only as Woodzley, on top of a small hill, lies a hollow log house, the beloved home of Ferald. An upbeat and unruly ferret, who's usually out stumbling upon his next adventure, which means his friends Pozzum, Kingston, Birzy and Mr. Wiggly can't be too far behind. When Ferald isn't being bothered by a couple of Pesky Crows, avoiding Evil Butterflies or being confronted by strange creatures named The Pooters. He's probably somewhere eating sunflowers just beyond the willow grove or a hearty lettuce sandwich. Each day brings something new, like a visit from a bow-legged alien who calls himself Qwiby or perhaps Ferald's girl ferret friend Sahsha will show up. No matter what the day brings, there is one threat to all the creatures of Woodzley, great and small. He was given the name Meany for a reason. He's a vicious and dangerous grizzly. Meany keeps everyone on their toes, he is the last one that you would want to see face to face. Unbeknown to Ferald's friends he didn't always live in Woodzley. He was born in a far away place, in a pasture of rough grassland on the fringes of a lush forest. As the youngest ferret of the family, he lived with his two big brothers Cleve and Zeff and his sister Jisha, along with their Mom and Dad. During the hottest day of the Summer, Ferald's parents decided to move the family to a place with a much cooler climate. They would all board a small boat, that was built by Ferald's Dad. Half way to their destination, a dam had suddenly burst forming a rogue wave, washing Ferald and his family out to sea. Fortunately for Ferald, he was saved by a majestic blue whale named Numzi Plume. It wasn't so fortunate for the rest of his family. With a small yellow bundle on his back, Numzi Plume set a course towards a simple place known only as Woodzley--where he knew that Ferald would feel right at home amongst the creatures there. Ferald has a deep connection with nature, especially during the Fall season or when it rains, and he has a third eye for finding his next adventure--even if most of the time it doesn't end exactly the way he planned. He likes to draw and build stuff, he has an amazing ability to build certain pictures that he draws. In fact, he designed and built his own Hollow Log House and Birzy's Birdhouse. He adores his friends and likes making new ones, but there are others in Woodzley with whom he doesn't get along with, namely Meany. Ferald likes to pretend that he is sleepwalking when he is bored and lacks attention, a needy ferret indeed. His favorite food is a lettuce sandwich or an occasional flower or two. He likes to read, but only books about bunnies. When he needs answers to his questions he ask Mr. Wiggly. It is through his adventures, friends and his foes, is where we get to see Ferald's various emotions and watch him evolve--as he celebrates the wonders of life...seen through the eyes of a ferret. Woodzley is an extension of the world of Ferald, as it house many of the places in which the characters live and play. Such as Ferald's Hollow Log House. Pozzum's Favorite Tree. Mr. Wiggly's Mossy Place. Kingston's Den. Birzy's Birdbath House. The Pooter's Pooty Pond. The Pesky Crow's Corn Field. The Rotten Pumpkins' Valley. Meany's Obscure Cave. Mizz Ladibug's Sunflower Patch. Ferald's hiding place behind the waterfall. Bitter Sweet Hill, where Ferald and his friends like to go pumpkin sledding down a hill, that's covered with wet leaves after the rain...inside of a pumpkin. Yes, kids will want to befriend Ferald. Sometimes he's happy, sad, rude, silly, scared, loving, brave, friendly, angry or needy. He likes to draw, play, read books, dance, nap, build things, go on adventures and play with his friends. Most of the key emotions that children go through or/and identify with is instilled in Ferald.